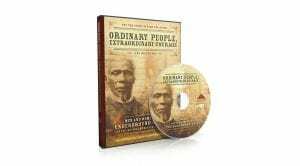 Ordinary People, Extraordinary Courage: Men and Women of the Underground Railroad draws the national phenomenon of the Underground Railroad into sharp focus by revealing the contributions of ordinary people, both free and enslaved, whose courageous acts on both sides of the Ohio River helped overthrow the institution of slavery. For two and a half centuries, slavery was a blight on our nation’s psyche. Through it all, more and more ordinary people acted in the face of human tragedy—and changed America forever. This unique exhibit explores the lives of real people, both free and enslaved, whose selfless acts of courage helped fugitive slaves find hope and freedom. Based on the book The Underground Railroad in Floyd County, Indiana by Pam Peters, this powerful story is woven through actual newspaper accounts, artifacts, and revealing illustrations and photographs into a rich experience highlighted by a dramatic, interactive feature-length multimedia film. At the heart of the exhibit are the actual New Albany residents—black and white, young and old, rich and poor—who were able to accomplish so much in the face of such great risk. After exploring the wealth of information the exhibit has to offer, individuals enter a small theater where they may view the multimedia film. Via a touch screen computer, visitors can select to watch the entire program or shorter segments. Larger groups can schedule a viewing of the multimedia presentation in the Center’s lower level meeting room. A staff member will introduce the program, guide the group through it, and answer questions afterwards. The length of the program can be tailored to suit the time constraints of the group. At least one hour is needed to view the film to give visitors the richest possible experience.